Did you know that advisors are, on average, 25% more stressed than other workers? So what's keeping advisors up at night? Survey says... compliance concerns. Many financial advisors, novice and seasoned alike, struggle to play the Chief Compliance Officer role. It's technical and tedious, and the consequences of mistakes can be steep. 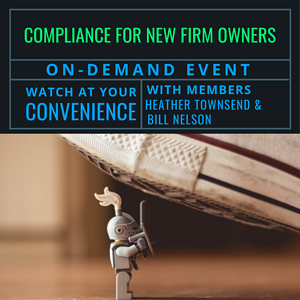 Learn how to tackle compliance like a pro and avoid costly mistakes with the help of two XYPN members, Heather Townsend and Bill Nelson in our next free webinar. This call is ideal for anyone considering launching a firm and joining XYPN. What was your experience with RIA compliance before you started your firm? What was it like to become registered? What’s a month like for your compliance program? What’s the best way to “reset” if you’ve haven't done a great job at compliance in your solo practice so far? What are the primary compliance essentials? Is there a standard best practice software package for cybersecurity? Heather Townsend, CFP® & CPA, is the Founder of Townsend Financial, a fee-only advisory firm that works virtually with clients in their 20s to 40s across the country. She believes finances should not be complicated, scary, or ordinary and is on a mission to change that. Heather became a Certified Financial Planner™ (CFP®) and established Townsend Financial after seeing firsthand the huge need for honest, comprehensive financial planning for everyone, regardless of income or net worth. Bill Nelson founded Pacesetter Planning to exclusively help engaged and newlywed millennials get their finances in order and set the pace for the rest of their lives. He helps engaged and newlywed millennials across the country increase their income, pay down debt, and invest for the future while making the most of their lives today. As a fee-only fiduciary committed to helping couples achieve their financial goals, Bill helps couples make better financial decisions and set goals for their future together.